Real estate agents - are you ready for VR? At the latest Apple event, the launch of ‘Animojis’ is more than just a new fun way to communicate, it is yet another definitive sign that brands (and real estate agents) should get serious about augmented and virtual reality. Such a scenario is getting easier and easier to imagine. The International Data Corporation predicted in February that total spending on AR and virtual reality will reach nearly $14 billion by the end of 2017. “The possibilities are endless and range from Minority Report-style programmatic outdoor advertising to superimposing sporting events and concerts on top of consumers’ living rooms,” added Sean Cullen, EVP, product, and technology at Fluent. A recent survey by U.S based brokerage Redfin showed that one in three home buyers are making offers sight-unseen. With the advancement of technology and the competitive nature of the real estate industry (and market), it is becoming clear that home buyers are starting to make use of alternatives to not only find their ideal home but also buy their new home, and the real estate agents that adapt are the ones that will thrive. The smart real estate agent will make use of the extensive technology available to them to help buyers make an offer on a property they haven’t physically visited before. 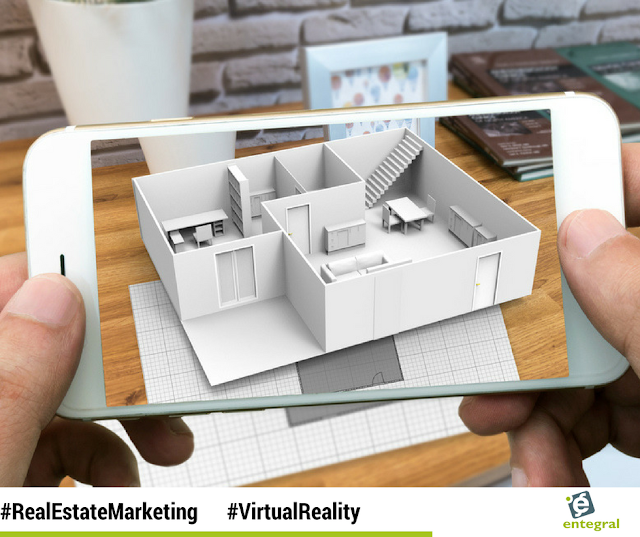 Virtual tours, which Entegral supports with free 360 virtual tours for real estate agents, and 3D home tours from companies like Matterport will play a vital role in listings of the future. The availability of suburb data, property information, and high-quality photos will further assist the potential buyer to make an offer. Google’s mobile-first indexing is only months away from those in the know, it is, therefore, vital to ensure your website is responsive. Even Facebook will reward you.